Goldman Sachs repaid repaid its $10 billion bailout partway through 2009, less than 12 months after the loan was made. Other banks in the U.S. and abroad were still struggling but not Goldman, which reported a record $19.8 billion in pre-tax profits that year, and $12.9 billion the next. Gary Cohn went without a bonus in 2008, left to scrape by on his $600,000 salary. Once free of government interference, the Goldman board (which included Cohn himself) paid him a $9 million bonus in 2009 and an $18 million bonus in 2010. Goldman was also facing an onslaught of investigations and lawsuits over behavior that had helped precipitate the financial crisis. Class actions and other lawsuits filed by pension funds and other investors accused Goldman of abusing their trust, making “false and misleading statements,” and failing to conduct basic due diligence on the loans underlying the products it peddled. At least 25 of these suits named Cohn as a defendant. Suddenly, Cohn and other Goldman officials were downplaying the big short. In June 2010, Cohn testified before the Financial Crisis Inquiry Commission, created by Congress to investigate the causes of the nation’s worst economic collapse since the Great Depression. Cohn asked the commissioners how anyone could claim the firm had bet against its clients when “during the two years of the financial crisis, Goldman Sachs lost $1.2 billion in its residential mortgage-related business”? His statement was technically true, but Cohn failed to mention the billions of dollars the firm pocketed by betting the mortgage market would collapse. Senate investigators later calculated that, at its peak, Goldman had $13.9 billion in short positions that would only pay off in the event of a steep drop in the mortgage market, positions that produced a record $3.7 billion in profits. Two weeks after Cohn’s testimony, Goldman agreed to pay the SEC $550 million to settle charges of securities fraud — then the largest penalty assessed against a financial services firm in the agency’s history. Goldman admitted no wrongdoing, acknowledging only that its marketing materials “contained incomplete information.” Goldman paid $60 million in fines and restitution to settle an investigation by the Massachusetts attorney general into the financial backing the firm had offered to predatory mortgage lenders. The bank set aside another $330 million to assist people who lost their homes thanks to questionable foreclosure practices at a Goldman loan-servicing subsidiary. Goldman agreed to billions of dollars in additional settlements with state and federal agencies relating to its sale of dicey mortgage-backed securities. The firm finally acknowledged that it had failed to conduct basic due diligence on the loans its was selling customers and, once it became aware of the hazards, did not disclose them. In the final report produced by the Senate’s Permanent Subcommittee on Investigations, Goldman Sachs was mentioned an extraordinary 2,495 times, and Gary Cohn 89 times. A Goldman Sachs representative declined to respond to queries on the record. The investigations and fines were a blow to Goldman’s reputation and its bottom line, but the regulatory reforms being debated had the potential to threaten Goldman’s entire business model. Even before the 2008 crash, the firm’s lobbying spending had grown under Lloyd Blankfein and Cohn. By 2010, the year financial reforms were being drafted, Goldman spent $4.6 million for the services of 49 lobbyists. Their ranks included some of the most well-connected figures in Washington, including Democrat Richard Gephardt, a former House majority leader, and Republican Trent Lott, a former Senate majority leader, who had stepped down from the Senate two years earlier. Despite all those lobbyists on the payroll, Goldman made its case primarily through proxies during the debate over financial reform. “The name Goldman Sachs was so radioactive it worked to their disadvantage to be tied to an issue,” said Marcus Stanley, then a staffer for Democratic Sen. Barbara Boxer and now policy director of Americans for Financial Reform. Instead, Goldman lobbied through industry groups. There was a lot for Goldman Sachs to dislike about Dodd-Frank. There were small annoyances, such as “say on pay,” which ordered companies to give shareholders input on executive compensation, a source of potential embarrassment to a company that gave out $73 million in compensation for a single year’s work — as Goldman paid Cohn in 2007. There were large annoyances, such as the requirement that financial institutions deemed too big to fail, like Goldman, create a wind-down plan in case of disaster. There were the measures that would interfere with Goldman’s core businesses, such as a provision instructing the Commodity Futures Trading Commission to regulate the trading of derivatives. And yet nothing mattered to Goldman quite like the Volcker Rule, which would protect banks’ solvency by limiting their freedom to make speculative trades with their own money. 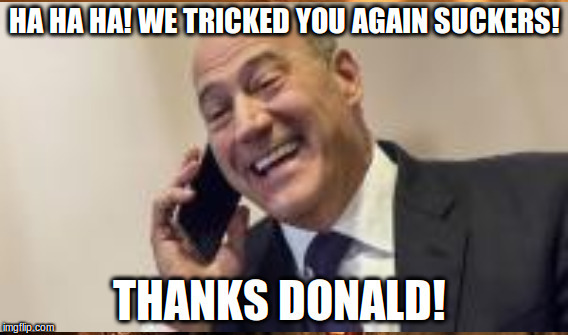 Unless Goldman could initiate what Stanley called the “complexity two-step” — win a carve-out so a new rule wouldn’t interfere with legitimate business and then use that carve-out to render a rule toothless — Volcker would slam the door shut on the entire direction in which Blankfein and Cohn had taken Goldman. It was 5:30 a.m. on Friday, June 25, 2010, when a joint House-Senate conference committee approved the final language of Dodd-Frank. By Sunday, an industry attorney named Annette Nazareth — a former top SEC official whose firm counts Goldman Sachs among its clients — had already sent off a heavily annotated copy of the 848-page bill to colleagues at her old agency. It was just the first salvo in a lobbying juggernaut. Within a few months, Cohn himself was in Washington to meet with a governor of the Federal Reserve, one of the key agencies charged with implementing Volcker. The visitors log at the CFTC, the agency Dodd-Frank put in charge of derivatives reform, shows that Cohn traveled to D.C. to personally meet with CFTC staffers at least six times between 2010 and 2016. Cohn also came to the capital for meetings at the SEC, another agency responsible for the Volcker Rule. There, he met with SEC chair Mary Jo White and other commissioners. “I seem to be in Washington every week trying to explain to them the unintended consequences of overregulation,” Cohn said in a talk he gave to business students at Sacred Heart University in 2015. Democrats lost their majority in the House that November, and Goldman threw its weight behind the spate of Republican bills that followed, aimed at taking apart Dodd-Frank piece by piece. Goldman spent more than $4 million for the services of 45 lobbyists in 2011 and $3.5 million a year in 2012 and 2013. Its lobbying spending was nearly as high in the years after passage of Dodd-Frank as it was the year the bill was introduced. Goldman lobbyists dug in on a range of issues that would become top priorities for Republicans in the wake of Donald Trump’s electoral victory. Records from the Center for Responsive Politics show that Goldman lobbyists worked to promote corporate tax cuts, such as on the Tax Increase Prevention Act of 2014 and Senate legislation aimed at extending some $200 billion in tax cuts for individuals and businesses. Goldman lobbied for a bill to fund economically critical infrastructure projects, presumably on behalf of its Public Sector and Infrastructure group. Goldman had seven lobbyists working on the JOBS Act, which would make it easier for companies to go public, another bottom-line issue to a company that underwrote $27 billion in IPOs last year. In 2016, Goldman had eight lobbyists dedicated to the Financial CHOICE Act, which would have undone most of Dodd-Frank in one fell swoop — a bill the House revived in April. Yet defanging the Volcker Rule remained the firm’s top priority. Promoted by former Fed Chair Paul Volcker, the rule would prohibit banks from committing more than 3 percent of their core assets to in-house private equity and hedge funds in the business of buying up properties and businesses with the goal of selling them at a profit. One harbinger of the financial crisis had been the collapse in the summer of 2007 of a pair of Bear Stearns hedge funds that had invested heavily in subprime loans. That 3 percent cap would have had a big impact on Goldman, which maintained a separate private equity group and operated its own internal hedge funds. But it was the restrictions Volcker placed on proprietary trading that most threatened Goldman. Prop trading was a profit center inside many large banks, but nowhere was it as critical as at Goldman. A 2011 report by one Wall Street analyst revealed that prop trading accounted for an 8 percent share of JPMorgan Chase’s annual revenues, 9 percent of Bank of America’s, and 27 percent of Morgan Stanley’s. But prop trading made up 48 percent of Goldman’s. By one estimate, the Volcker Rule could cost Goldman Sachs $3.7 billion in revenue a year. Goldman had five years to prepare for some version of a Volcker Rule. Yet a loophole granted banks sufficient time to dispose of “illiquid assets” without causing undue harm — a loophole that might even cover the assets Goldman had only recently purchased, despite the impending compliance deadline. The Fed nonetheless granted the firm additional time to sell illiquid investments worth billions of dollars. “Goldman is brilliant at exercising access and influence without fingerprints,” Kelleher said. By mid-2016, Goldman, along with Morgan Stanley and JPMorgan Chase, was petitioning the Fed for an additional five years to comply with Volcker — which would take the banks well into a new administration. All Blankfein and Cohn had to do was wait for a new Congress and a new president who might back their efforts to flush all of Dodd-Frank. Then Goldman could continue the risky and lucrative habits it had adopted since traders like Cohn had taken over the firm — the financial crisis be damned — and continue raking in billions in profits each year. Goldman’s political giving changed in the wake of Dodd-Frank. Dating back to at least 1990, according to the Center for Responsive Politics, people associated with the firm and its political action committees contributed more to Democrats than Republicans. Yet in the years since financial reform, Goldman, once Obama’s second-largest political donor, shifted its campaign contributions to Republicans. During the 2008 election cycle, for instance, Goldman’s people and PACs contributed $4.8 million to Democrats and $1.7 million to Republicans. By the 2012 cycle, the opposite happened, with Goldman giving $5.6 million to Republicans and $1.8 million to Democrats. Cohn’s personal giving followed the same path. Cohn gave $26,700 to the Democratic Senatorial Campaign Committee in 2006 and $55,500 during the 2008 election cycle, and none to its GOP equivalent. But Cohn donated $30,800 to the National Republican Senatorial Committee in 2012 and another $33,400 to the National Republican Congressional Committee in 2015, without contributing a dime to the DSCC. Cohn gave $5,000 to Massachusetts Republican Scott Brown weeks after news broke that Elizabeth Warren — an outspoken critic of Goldman and other Wall Street players — might try to capture his U.S. Senate seat, which she did in 2012. Goldman Sachs, under Cohn and Blankfein, was hardly chastened, continuing to play fast and loose with existing rules even as it plunged millions of dollars into fending off new ones. In 2010, the SEC ran a sting operation looking for banks willing to trade favorable assessments by its stock analysts for a piece of a Toys R Us IPO if the company went public. Goldman took the bait, for which they would pay a $5 million fine. An employee working out of Goldman’s Boston office drafted speeches, vetted a running mate, and negotiated campaign contracts for the state treasurer during his run for Massachusetts governor in 2010, despite a rule forbidding municipal bond dealers from making significant political contributions to officials who can award them business. According to the SEC, Goldman had underwritten $9 billion in bonds for Massachusetts in the previous two years, generating $7.5 million in fees. Goldman paid $12 million to settle the matter in 2012. Just two years later, Goldman officials were again summoned by the Senate Permanent Subcommittee on Investigations to address charges that the bank under Cohn and Blankfein had boosted its profits by building a “virtual monopoly” in order to inflate aluminum prices by as much as $3 billion. The last few years have brought more unwanted attention. In 2015, the U.S. Justice Department launched an investigation into Goldman’s role in the alleged theft of billions of dollars from a development fund the firm had helped create for the government of Malaysia. Federal regulators in New York state fined Goldman $50 million because its leaders failed to effectively supervise a banker who leaked stolen confidential government information from the Fed, which hit the firm with another $36.3 million in penalties. In December, the CFTC fined Goldman $120 million for trying to rig interest rates to profit the firm. Goldman’s giving in the presidential race appears to reflect polls predicting a Clinton win and the firm’s desire for a political restart on deregulation. People who identified themselves as Goldman Sachs employees gave less than $5,000 to the Trump campaign compared to the $341,000 that the firm’s people and PACs contributed to Clinton. Goldman Sachs is relatively small compared to retail banking giants. Yet, according to the Center for Responsive Politics, no bank outspent Goldman Sachs during the 2016 political cycle. Its PACs and people associated with the firm made $5.6 million in political contributions in 2015 and 2016. Even including all donations to Clinton, 62 percent of Goldman’s giving ended up in the coffers of Republican candidates, parties, or conservative outside groups.